Amazing. As flat and lifeless as incarnum was, Akashic Mysteries is vibrant and exciting. From the near-east flavor (which works very well, but it by no means required) to the simplified mechanics, this book is a home-run. I liked Dreamscarred's take on psionics, but felt that Path of War missed the mark. This new book, however, has already become my favorite 3pp resource. Viziers, gurus and daevics are a great alternative to bards, monks and paladins -- they take the game in different directions without breaking it, opening it up to such interesting possibilities. So far, we're having a blast with these classes, and they're integrating seamlessly into our existing game. The new races aren't as interesting, but are decent. There are some great feats and archetypes in the book also (but no archetypes for the new classes -- hopefully we'll get those soon). I seriously was not expecting to like this so much. I'm blown away. It has been coming for a long time - the completed Akashic Mysteries book, which clocks in at a mighty 97 pages, 1 page front cover, 1 page editorial, 1 page ToC, 1 page SRD, 2 pages of advertisement, leaving us with 92 pages of content, so let's take a look! So, what is this? The simple reply would be "fixed incarnum with a Silk Road flavor." If that does not ring any bells, let me reiterate. Akasha is a type of magic that is utilized most commonly via veils that are channeled through conduits in the body called chakra. Every creature is supposed to have a finite amount of essence in their being, which is called essence pool. Essence is typically not expended, but veils and other akashic effects require it for activation and thus, essence needs to be assigned to a specific function. This is done by investing essence into the receptacle, which can be a veil, an akashic feat (more on these later) or ability. Reallocating or investing essence, unless otherwise noted, is a swift action. The process of harnessing veils is called veilweaving and thus, the classes here are known as veilweaving classes. Progressing in these unlocks new chakras, which allow for veils or function of veils or other akashic abilities to be used in ways that are based on the veil in question. Each veil is associated with a chakra and veils do not interfere with magic items worn in that slot, but no two veils can occupy the same chakra. However, some veils may be employed in different chakra, often with different effects depending on the chakra used...however, one veil may not be in use for two or more different chakras. You can only ever have one veil of a given type in effect atone time. The general chakra available are Hands, feet, Head, Wrists, Shoulders, Headband, Neck, belt, Chest, Body - though some classes can gain unique chakras. Veils interact with magic as though they were magic and SR applies against most effects, but not versus auras or AoE abilities unless otherwise noted. Veils overcome their own SR automatically. Veils manifest as physical constructs that may temporarily be sundered and suppressed, with hit points and hardness of the veils depending on the level of the veilweaver. Concise rules are provided regarding descriptors, identifying veils, etc. Now there are a couple of more basic terms we need to cover: Some feats and veils require the binding, rather than the investment of essence - this means that the essence is "stuck" in the receptacle for 24 hours or until the user shapes veils anew after resting. If such a receptacle is sundered or disjoined, the user takes essence burn equal to the total of the invested essence. Essence burn eliminates essence and requires 1 minute of quiet contemplation per point of essence burn to recover. Temporary essence points, if granted by anything, are burned first and may not be recovered. Veils do not require active concentration to maintain, but upon the veilweaver falling unconscious, they are suppressed until he regains consciousness. Veils sundered while the veilweaver is unconscious are destroyed and cannot be redeployed until he has rested. Finally, there would be essence capacity, which denotes the number of essence points that can be invested in any given veil, feat, class feature, etc. - these would be 1 for the first 5 levels and then increase by +1 at 6th and every 6 levels thereafter. Okay, the first thing you'll note is that that the terminology has been cleaned up when compared to the earlier WIPs - the respective verbiage makes sense, is self-explanatory and if this sounds complicated, rest assured that it isn't necessarily once you have grasped it: Basically, you have points that you move around to make magic stuff. Sometimes, you need to fix the points, sometimes you temporarily lose them, but generally, you'll be pretty flexible in moving around your points of magic stuff. The veils can be powered by the magic stuff and you learn to use them in more ways as you gain experience. Much like a cool button or temporary tattoo, the effects of veils depend where you wear them. That's about as simple as I can explain it. Anyways, we obviously need to re-evaluate the 3 akashic base classes released so far in order to ascertain whether/how they have improved. If you are not interested in this section, skip ahead. The text is modified, where appropriate, to reflect the changes made (quite a few! ), but if you're already familiar with the akashic classes and don't care about the nit and grit, go ahead. It should be noted, though, that the classes have changed quite a bit since their original iterations. Daevics gain d10, 4+Int skills per level, proficiency with simple and martial weapons, all armors and shields (but not tower shields), full BAB-progression and good Fort- and Ref-saves. The veilweaving here is different from the other two classes, but there are similarities - the DCs, if appropriate, is DC 10 + number of essence invested in the veil + Cha-mod (making Charisma the governing attribute here and decreasing the DC from the WIP to more generally palpable levels), but there is a crucial difference to default veilweaving - the veils granted at 1st, 4th, 9th and 15th level must be selected from the list of the chosen passion, whereas the other veils gained operate like standard veils, meaning the progression is from 0+1 to 4+4 over the 20 levels of the class. Essence is gained at 1st level, increases at 3rd and scales up to 10 for a net of every 1/2 progression. Chakra binds begin at 2nd level and scale up to 6, with progression being Feet, Hands, Wrists, Shoulders, Belt, Neck, Chest. On the minor engine-tweaks, 5th level nets +1 to saves versus enchantments, which scales up by +1 every 3 levels thereafter. Now I noted the existence of passions - these are chosen at first level. When a daevic invests essence into a veil of a passion (called passion veils), it counts as being invested in all passion veils, meaning that the very scarce essence pool makes investing points here more efficient. However, at the same time, power escalation is prevented by an explicit rule that forbids synergy with veil-specific feats, effects or catalysts, though you CAN also bind them as normal veils and circumvent these restrictions (but also foregoing the passion veil benefits), adding a further dimension to these veils. Three sample passions are provided, and all modify the list of available passion veils to choose from, the class skill list and all ultimately change how the class plays, so what are they? The first passion would be desire - which allows 3rd level daevics to use Charisma for Appraise and may replace both Dex and Int as prereqs with Cha for the purpose of feat-prerequisites, offsetting some, but not all strain that would otherwise be burdened MAD-wise on a full BAB character. The in-game rationale for this, while not perfect, at least is sufficient for me - why do I mention this? Because I get pimples from the default "I'm so good-looking I hit foes"-rationale employed by some abilities out there. So kudos! Bonus-feat-wise, they gain Precise Shot and Willful Throw. An interesting option - at 6th level, a passion mutates into one of 2 choices - here, this would be love or avarice. Love provides an NPC-companion that is pretty powerful (-2 levels or -3 CR for less humanoid ones...) - but it does not stack with Leadership. Furthermore, as a balancing caveat, eidolons and similar creatures are dismissed on behalf of the paramour and the character thus chosen may not be a full spellcaster (or full-spellcasting equivalent class like the veilweaver). Daevics that follow the passion of avarice add the returning and called abilities if within the daevic's possession for more than 24 hours - however, the abilities are lost again upon willingly giving them to another creature. On the nitpicky side, there are some minor formal glitches here. At 12th and 18th level, this ability improves regarding action economy and adds unnatural lust to the weapon thus thrown, respectively. The final passion, wrath, has some nasty tricks: Whenever the daevic bull rushes or overruns a foe, he may execute an AoO against the foe before moving the foe, though this powerful effect is somewhat countered by the lack of gained bonus feat - instead CMB and CMD increase at 5th level and every 3 levels thereafter. Wrath may transform into justice or vengeance at 6th level, with justice providing access to the vital strike feat-chain...and the option to execute the Bull Rush/overrun-granted AoOs with Vital Strikes added. As for vengeance:1/round full-attack against a target when succeeding a Bull Rush or Overrun, but only with natural weapons and only against said target. This ultimately boils down to a meat-grinder -only shreds and gooey bits remain in the path of such a daevic. The changes to the passions made here are unanimously awesome and help keeping the daevic powerful sans being too strong. Absolutely beautiful, as far as I'm concerned. The Blood Bind ability's write-up fails to mention that it's gained at 12th level (which one glance at the table confirms, but still a minor aesthetic hiccup) - but it *is* interesting: It provides essentially an additional slot, into which the daevic can bind Neck, Head, Headband and Body slot veils, but whenever he does that with a non-Blood veil, he takes twice the essence invested damage each round and when reassigning veils, which means it can't be abused. Nice! The capstone is a boring native outsider-apotheosis and can reassign veils via 1-hour meditation. Odd - the daevic gains the body-slot at 20th level, which means that prior to this level, he can bind body veils only to the blood slot. All in all: Vast improvement over the original iteration. Let's move on to the guru, shall we? The Guru base-class gets d8, 6+Int skills per level, proficiency with light armor and simple weapons, but not shields and enhance these based on class choices made - more on that later. Chassis-wise, the guru receives a 3/4 BAB-progression and good Ref- and Will-saves. They begin play with 1 veil and scale that up to 8 and 1 essence, which increases to up to 20. The veilshaping of the guru has the DC equal to 10 + points invested in the veil + Wis-mod, making Wisdom the governing attribute. 1st level Gurus also choose a philosophy,. which grants a linear progression of abilities at 1st level and every 3 levels thereafter. Philosophy abilities tend to burn essence points, which means that the essence cannot be used or reassigned until the guru has had a chance to meditate, providing a complex game of resources between flexibility and power - you can't write player agenda in larger letters. Additionally, gurus of first level get stunning fist, but with some tweaks - the benefits can be applied to weapon attacks made with gentle touch and the guru can burn three essence to regain 1 use of stunning fist 1/day, +1/day at 5th level and every 5 levels thereafter. 2nd level nets chakra bind in the progression of Hands, Feet, Head, Headband, Neck, Belt, Body. 4th, 10th and 19th level increase the essence capacity of chakras by +1. The 3rd level guru may interrupt the chakras of foes when executing an attack - this works as a standard action pretty much akin to vital strike and has a DC of 10 + Wis mod, +2 per essence invested in gentle touch, which allows for a pretty nasty escalation of DCs - penalizing one attack mode, decreasing movement rate, decreasing shield and Dex-bonuses and high-level blinding, stunning and exhausting foes can be found amidst these effects. These last for Wisdom modifier rounds and a single target may only be affected by one such disruption at any given time. 7th level nets an autohealing ability determined by the amount of essence bound, though essence invested in this limited-use ability cannot be reinvested until rest. So yeah, no abuse! Yay! 8th level allows gentle touch to act as sunder-attacks that ignore 1/2 hardness AND allows for the damaging of constructs. As a minor nitpick, we once again have to consult the table, since the ability doesn't say the level it's gained. 16th level provides the option to expend Stunning Fist uses when attacking foes to double as what amounts to a single-target disjunction that leaves items intact. As a minor complaint here: The pdf sports several spells not italicized and captalizes gentle touch here as though it were a feat, not an ability...but this is aesthetics and doesn't impede the book's worth. The capstone provides healing and even temporary essence to the guru when e.g. disjoining foes - cool and surprisingly powerful! Now I mentioned philosophies - a total of 3 are provided, with each granting its own set of uncommon weapon proficiencies. The first of these would be the Akasin. When meditating in an area of bright light, they can gain a pool of temporary essence that is burned first by the respective philosophy abilities and amounts to 1/2 class level, which it may never exceed. Essence burn taken to activate an ability nets this guy 5 times the burn taken temporary hit points. In addition, the akasin can take 1 essence burn to execute veil of positive energy as an SP at full caster level. At 4th level, healing blindness is possible via 1 essence burn, as is shooting rays - which deal an untyped damage that is more potent vs. the undead. Not a fan of the untyped damage here, but the save to negate blindness and halve damage is neat. Higher level akasins further marginalize the poor shield bonus to AC, bypassing it alongside 2 points of AC with blades of light - it should be noted that expenditure of stunning fist uses can further upgrade this ability with brilliant energy. As a pretty cool note, though - the mirrored property does help against this, which eases my grumbling. 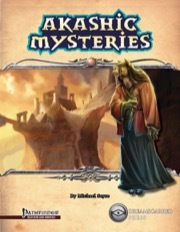 Akashic Mysteries has grown to become my favorite Dreamscarred supplement. I never quite dug Bloodforge or most of the Psionic books, and I absolutely love Path of War. But Akashic Mysteries hits a very good balance that I feel the other books, save maybe the Psionics books, don't hit. However much I love Path of War, I feel that it sort of leaves GMs out in the cold. GMs using Akashic Mysteries are much better-equipped: the races and monsters feel like a natural addition to almost any setting, the monsters are very cool additions or extensions of existing monsters (such as a Rakshasa that uses Veils). The flavor of the book is decidedly different than most mainline Pathfinder, and that does a lot to endear me. It draws from Egyptian, Middle-Eastern, and Indian styles, which I feel is definitely a niche not tapped into enough. However, it doesn't feel alien to your 'normal' fantasy, like bringing in a samurai would be (not that I'm knocking it! ), the Akashic material can fit right in. There are downsides. The Daevic's Passions are hyperfocused on a handful of fighting styles. The archetypes of the book definitely show its age; a fighter archetype that gives up Weapon and Armor Training, an archetype for the non-Unchained summoner to me are Exhibit A of that. But a few duds in any Pathfinder book is nothing to cause an uproar about, I am just disappointed because I want to like everything in this book. Overall, it feels different enough from baseline Pathfinder for me to like it. Psionics just felt like a different way to mostly do the same things, Path of War, while I firmly believe it's awesome, feels like a different approach to martials, while Akashic Mysteries genuinely feels like something that has not been tapped. I dont have time to write a full review right now, but I will say that I've played two characters up to 9 with this book and love it. Incarnum gets the DSP treatment! During the last years of the third (point five) edition of D&D, Wizards of the Coast started getting crazy not only with tons of new classes (must of them sucky), and trying new magic systems (from the everyday blasts of the warlock to the martial magic of the Initiators). One of this was MoI, a system of everyday magic with a few twists. Unlike many of its peers, Incarnum was maligned for specific reasons. When Pathfinder came out, a lot of people started converting stuff, fans and 3rd party publishers alike. One of them was Dreamscarred press, who made a complete revision of the psionic system, much like Paizo did with the core book. Unfortunately, most of the stuff released wasn’t part of the SRD, which dictated what things could be worked on by 3rd party publishers. Some devilish review of the OSR brought the fact that you can’t trademark rules, and that’s the reason we now have binders, initiators and, with the release of AM by DSP, incarnum in Pathfinder! Which in my opinion benefited some of these systems by getting away from the fluff or restrictions of the originals. Ok, so what problems did MoI had? What improvements did DSP make? Read on! FLUFF: Incarnum’s fluff wasn’t that bad, it was the distilled energy of souls from the past, present and future. This was OK unless your campaign didn’t have souls as a concept. Reincarnation? Dual or multipart souls? AM gets away from the souls trap and uses a concept more like Chi or Od. It is a form of truly ancient magic that combines the user’s own magical energy with the magic of the world. Of course, any fluff can get a cosmetic lift, but here it impacted the crunch: Incarnum was tied to the alignment system. A lot of the powers were closed to users just because of their alignment and two of the three classes had strict alignment requirements. Not so with AM. Next we have the nomenclature. While magic used standard fantasy and psionics a kind of sci-fi, MoI was… odd. Meldshaper? Essentia? Chakra? Incarnate? Soulborn? Not very cohesive if you ask me. AM adopts the one Middle-East reference (chakra) and runs with it. We have more flavourful Veils, Veilweavers, Viziers, Gurus, Essence etc. Finally, and MoI greatest flaw is… that it was blue… no, not sad (well in a way yes), but everything from the races to the melds, items and even the frigging FEAT NAMES was a kind of blue! MoI: 50 shades of blue… It is worse when you consider that blue has a Lawful connotation in D&D (see alignment auras), and it’s worse even when you take into account the whole system has most of its weight in alignment. Why not vary the colors? CORE: After the fluff, the core of the rule system, had its share of problems. First we have 3 base classes, which were the Incarnate, a ½ BAB class master of the subsystem, with an ugly alignment requirement: neutral something, so only 4 of the 9 alignments permitted; the Totemist, coolest fluff of the bunch and the only one without an alignment restriction, who had ¾ BAB and derived power from magical beats and yes, even the tarrasque; finally we had the Soulborn, a full BAB class who couldn’t be any neutral, leaving again 4 possibilities from the 9 alignments. The incarnate was ok, but the soulborn sucked beyond belief, even the fighter using its normal feats for incarnum was better at everything than a soulborn, and we are talking about D&D 3rd edition fighter, who also sucked. AM has 3 classes too. The Vizier replaces the Incarnate and really feels like an akashic wizard, it can even dabble in item creation! The Guru replaces the Totemist as the ¾ BAB class and gets away from the magical beast flavor, instead going a more monkish route. Finally, the Daevic replaces the Soulborn as the full BAB class and does so with style. My personal favorite and one of the few mystical melee classes done right, it can veilweave from level 1! Not even the Pally nor the Ranger do that! Apart from the new classes, we get archetypes for many Paizo classes and some DSP too. There is even an animal companion archetype! Of note are the Dread and Summoner archetypes, who really embrace the new system with high-concept archetypes. The Dread loses all psionic power and gets veilweaving, and the summoner gets a variant eidolon with veilshaping instead of the normal evolutions. This two archetypes really change the way you play these classes! After the archetypes we get the Amplifier PrC, a “theurge” that mixes veilweaving with either spellcasting or psionics, nothing too fancy and one already present in MoI. The second PrC, the Black Templar, echoes the second coolest thing in MoI after the Totemist, the Necrocarnate, by focusing on draining life and control his victim’s corpses. I dislike the name and will use the 2nd edition D&D wizard’s kit’s name from Al-Qadim’s The Complete Sha’ir’s Handbook: Ghul Lord. Next, the races. MoI had three races (four really), two that shared a racial history and had some reptilian origins, but really were humans with scales in the throat or spines in the arms. The third one was a fey race for the sake of being fey. The only salvageable one was a variant human, who had a point of essential instead of a skill bonus and lived less… big deal. AM takes a note on the Egyptian gods and presents us with 3 (9 if you take into account racial variants). The only problem is that they are all furries, so if you have a problem with that, just don’t use them. Here is the only place where I would have liked more variety, maybe a subrace for another more standard one or an exotic versions of races like the Vyshkanya, Catfolk, Tengu or Vanara if you wanted to go the furry way. Then we get to the powers. AM not only gets away from skill bonuses, it really goes wild with what you can do with your characters, and again tinges them with Middle-East flavor. Of course some of them overlap with spells or are even spell-like abilities, but believe me they ooze flavor. Some of them work well for other classes, so if you dabble in akasha via feats or multiclass you are in for a surprise. Finally we get to the monsters. MoI had a lot of sad… sorry, blue monsters that were just plain bad. We had monster entries for the new races, blue incarnum dragon and giant with meldshaping, blue incarnum zombies and oozes, constructs with souls (which sounds cool but campaign dependent) and not much more. The only redeeming grace were the lost, a template for creatures infected by a combination of strong emotion and incarnum. HOWEVER, the monsters from AM run again with the Middle-East motif, my favorite being the new daeva outsiders. They are a new type that, unlike any other outsider race out there, are not related by alignment. They are a race of symbiotic outsiders that feed on emotions, and there are many of them. Since they can make a symbiosis with other creatures, you can get a nasty, or pleasant, surprise after killing/defeating a rival or foe and having one of these appear. Along the many type of daeva comes a single akashic dragon, the amphibian-looking Vitra. The only thing I disliked is that a couple of these monsters were a shade of blue, and gave me some unpleasant flashbacks LOL. The furry theme continues, with at least two of the daeva being anthropomorphs. We at last have Apsaras in D&D, which are a kind of Hindu nymphs. This will definitely be the first non-Core book I order for meatspace use. Thank you for the 5 star review Milo! Very appreciated, and I'm glad you've enjoyed this product so much! 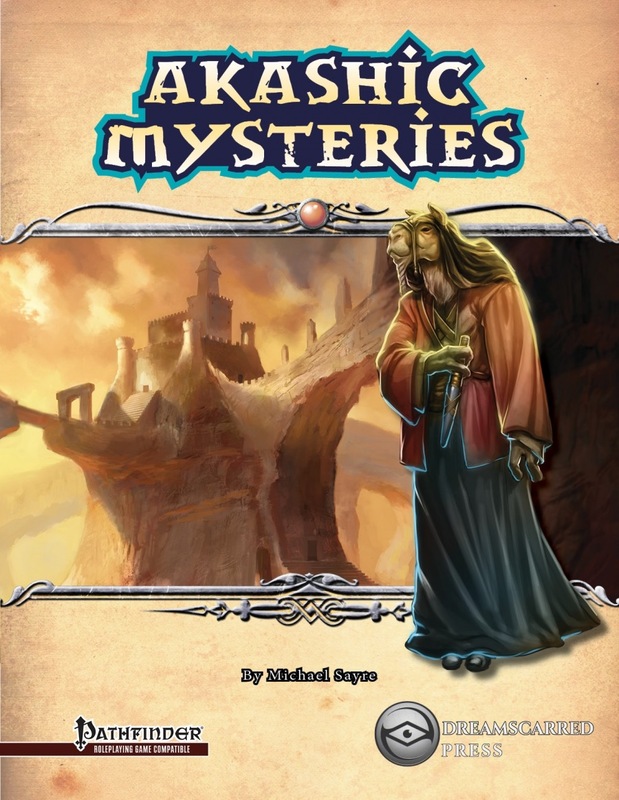 Akashic Mysteries has been a long time coming, and I'm glad it's finally available in a complete sourcebook! I will review this as well after reading through the newest material. On an unrelated note, I double-checked with Jeremy and the softcover preorder availble on this page is for a color book, just in case anyone was wondering or had any concerns on that front. I did wonder a little about that, but I was certainly hoping it was color with all the lovely artwork in this book! Good to know for sure! I haven't had a chance to check my WIP download for an updated version, but I think I will definitely get this beautiful book though. Thank you to everyone who's taken the time to rate Akashic Mysteries! I'm looking forward to reading the full reviews! And after a draft was eaten by virtual goblins, my review is up. Man, looking at the whole book now changed my perspective, it is a thing of beauty! On the races. Nameer still have the tail sweep? or were claws supposed to replace both bite and tail sweep? Under monsters, the akashic sub-type gives monsters bonus essence equal to 1/2 their HD. This obviously doesn't apply to races, since they use class HD, but a short note would keep away rules-lawyering munchkins. Thank you for the review! I'm glad you appreciate it. This was something that was discussed a fair bit during playtest on the GitP forums, and ultimately it was decided to allow the nameer to keep the tail sweep. So, it's definitely not a typo or anything, more of a stylistic and mechanical choice made after some debate. It's important to note that it gives them bonus essence equal to their racial hit dice, which the player races don't have since they derive their HD from classes. I'll make a note of your comment though and see if we have room when we go in to update some of the other layout and editing issues to add a "failsafe redundancy" sidebar restating that the player races do not gain essence from class hit dice. Aerial Nimbus, Stormcaller's Band, and Storm Gauntlets should have the air descriptor. A tiger can't hit you with its tail without looking silly, but maybe the nameer are like saiyajins. Coolest sub-race in my opinion. Shame the races chapter is so short, most of them sound really cool. A tiger can't hit you with its tail without looking silly, but maybe the nameer are like saiyajins. Shame the races chapter is so short, most of them sound really cool. The gamla Spit ability feels kind of weird: sure they're camel furries, but but it just sort of feels......crude. For personal use I will probably change it to a beam that causes night-time stuffiness. I feel like this needs an Expanded pretty soon: the base classes feel "indistinct" or maybe "unfocused". I'm not exactly sure why: maybe I prefer my classes with more laser-like focus on what they're supposed to be and do. Camels (and various critters in the same general family group) spit. It's a thing they do. The akashic races were, by and large, very much intended to draw strongly on the roots of the base animal, and to emulate magically evolved versions of those critters to a high degree. The spit may seem a little crude, but a camel who had evolved alongside humans would probably find that using your forelimbs to batter another creature when you could have just warded them off with a more cultured and less harmful wad of stomach juice is excessively crude. I like to view it through a lense of potential cultural perspective. I would say the vizier is the only class that's really nebulous in purpose, and that's because it's (essentially) a wizard analogue; it can be pretty much whatever you want it to be, and that's very much on on purpose. The guru's paths and the daevic's passions give you pretty clear direction on what your character does and how it does it, though you still have some flexibility in how you do it. I can't really think of any core or DSP class that's more focused than a guru or daevic, except maybe a kineticist? Guru fits into a similar mold as an Inquisitor or Bard, and Daevic leads you along similarly to a Ranger or Paladin. Camels (and various critters in the same general family group) spit. Oh I know they do. I just find vomit a bit over the line for me to imagine it. Maybe I'm just unimaginative: like I said in the previous thread on veils I tend to need strong guidance in that area. It could also be the art: the class iconics for the daevic and the guru don't look like anything in particular so maybe it's hard for me to tie a mental image to the class feature functions. I really don't want to come off like I think the product is terrible. I'm just doing that thing everyone else does where they quantify something out-loud in the hopes they get listened to. Have you seen any of the guides for the akashic classes? They can be very helpful. If you'd like, I can dig up a link for you. The vizier in particular can be a bit more technical when you're really wanting to leverage system mastery, because there's generally three or four veils that all have shared interactions or that can support each other (Pestilence Cloak and Stare of the Ghaele go great together, for example, Gorget of the Wyrm can interact with quite a few other veils depending on your element and bind choices, etc. ), and getting your layout assembled can take a little thought. Ruler kind of pointa you towards the Will save based veils, but Seer and Crafter are more veil neutral and leave you a lot of room to explore. As you're getting used to building a vizier, my suggestion would be to pick either a veil you think is really cool, or a concept you'd like the character to embody. Building around a veil is probably easier as you're getting started with the system. If you decide, for example, that you want to kind of designate Gorget of the Wyrm as your signature veil, then you can kind of preassemble some complimentary veils that you use with it. If you're looking to toast enemies, maybe you choose fire as your element, snag Circlet of Brass to boost your damage, and snag Riven Darts to give you a secondary damage option while your breath weapon recharges. Or maybe you choose cold, use your bind to grant your allies cold resistance, and then double-down with Polar Snowshoes. The nice thing is that you know all your veils and can reshape them every day (or even on the fly to a limited degree depending on level), so you can continually refine your loadout or hotswap a veil that turns out not to be helpful that day. The veils for those classes are a lot like the spell lists for Paladins or Inquisitors, respectively. They don't define your character, they're tools to flesh your character out. With the daevic, your passion and passion veils are going to give you your basic direction, whether that be switch-hitting debuffer, defensive party leader, or natural attacking blender. You use your veil selections to either reinforce that concept, or to branch out and make your character a bit more well-rounded, or to add a neat trick to your character that you can use for some unusual advantage in or out of combat. Your binds can also help you decide which veils you want to take at which levels. The Guru is a strong debuffing combatant with a robust skill list. His veils are going to be options for you to enhance or focus your abilities, or handy tricks for knocking out certain types of obstacles. There's no veils that any Guru builds needs, they're just tasty icing on an already delicious cake. I tend to snag veils that supplement my party role or compliment my fighting style; Forcestrike Knuckles for Sineaters, Snakehandler's Gauntlets and Eyes of the Hawkguard for Vayists, Immaculate Touch for Akasins so they're a little more "paladin-y", etc. Maybe the base classes just need more stuff for me to find something that works for me: they could use some more feature selection, as well as some archetypes that change how they work. I'm more excited by the archtypes for existing classes probably because they expand an already-existing space I can wrap my head around and simply because I love expansion of existing things. Here's a link to the Vizier, Guru, and Daevic guides. Sorry if I'm stealing your thunder Ssalarn. There's some pretty good ideas there about the three classes. What characters does everyone want to play? This is my list! It also sounds like a party already! @Ssalarn, would you let the magus use Cha for her veilweaving? since eldritch scion already changes Int bailities to Cha. I would have prefered a snake-y blood line but since eldritch scion uses bloodrager's... well. If you do plan on playing an akashic shabti/vanara/samsaran/vishkanya, might I suggest giving these akashic versions a look (just scroll past deo). Do note they haven't been playtested and are homebrew though, not Dreamscarred Press material. They look good Milo, but are they variants? What do being akashic or having a virtual veil replace? What characters does everyone want to play? Aasimar (possibly idyllkin for thematics?) yaksha caller with Nature Soul/Shape Veil/Animal Ally/Celestial Servant/Boon Companion (might reverse Boon Companion and Celestial Servant though). Gain a sacred wolf and an animalistic yaksa. A little MAD since it needs decent Constitution and Wisdom plus good Charisma, might consider snagging a level of daevic instead...but definitely fun. Ajibachana dhampir vizier that goes path of the crafter, as an artificial creation themselves, they have an interest in experimenting, perhaps seeking to justify their existence...besides, their Indian roots fit so well. I imagine them regularly experimenting with different veils just for fun, not really having any regular options. Pitborn tiefling daevic that goes with the wrath passion, probably depend on the game whether I went justice or vengeance, though vengeance would be awfully tempting. Go with lots of natural attacks and wreck people, fun, fun. Svetocher dhampir daevic that goes with the dominion passion, probably tyranny, using El's Utterdark Shield and Stalker's Tabi. Might try and keep the Wisdom high enough to qualify for Shape Veil a few time, some nice darkness/undead related vizier veils that would be fun to go with a 'dark/undead knight' theme. Tiefling vizier who worships Asmodeus, goes path of the ruler and gets into a bunch of mind-affecting veils in general, as well as some fire stuff to deal with the immune to mind-affecting effects. Mantle of Murderous Intent is fun, throw on Stare of the Ghaele and Crown of Inevitable Command, Vestments of the Maharaja, and keep Circlet of Brass and Gorget of the Wyrm as a possibility, breathing out the fires of Hell. Edit: Oh, Ssalarn, any chance of some feats that make veils a little easier to hide without investing in Disguise? I was thinking without essence, though a feat to keep a passive veil invested with essence hidden more easily or one that allows an activated one to be invisible until used would be neat. Or perhaps another veil whose purpose is to conceal other veils? Nice line-up! Vanara Vayist is such a hilariously natural choice for a character, one of the guys in a local playtest group played for a while and absolutely loved it. Gamla Guru (Akasin) using polearms to kind of tank up and cover a big area. Vizier (Seer) built so I can play him like he's the Flash or a similar comic book style speedster. I got the idea from a really cool article I read on Lost Spheres Publishing's blog. I've already played a vizier geared up as a necromancer, a vizier specced for sniping, an alqarn vizier tank, a gamla Sineater, a daevic (Wrath) who believed that a god only he could see and speak to was transforming him into a dragon so he could avenge his dead lover, and a rakshasa-blooded tiefling vizier (Ruler) who was basically a magical grifter. So, keeping in mind that I've been doing a lot of writing and playing with Drop Dead Studio's Spheres of Power which already has very flexible casting stats, I personally, as a GM, wouldn't have any problem with allowing a player to swap CHA for INT on a Snake Charmer who had already switched their casting stat via Eldritch Scion. another question about the races. how mant race poiny would being akasha and having a point of essence cost? They are variants. Human loses bonus feat, samsaran loses samsaran magic, shabti loses SLA, vishkanya loses low-light vision. I like the Vizier like that. The other two seem a little too focused for a 3 class supplement with new system, for my tastes. I like to see the equivalent of the generic 4 (Fighter, Wizard, Cleric, Rogue) in at least 1 class of a new system - allowing the player to focus on what aspect he wants to play. I love the Vizier. I can't wait for an expansion with more specific types. As a sidenote, if I had any issues with Path for War is that there is not "I fight with maneuvers, and whatever else I do is more up to the player" - they were all a little specialized for my tastes. I'd say mostly it's the Vizier's choose-sable features: they're not terribly inspiring. Something about them doesn't feel that distinctive, not like an Arcane School or Domain. Well there is Fighter and Warlord archetypes for generic fighters. Vizier covers wizard. Cleric would be an akasin guru if your positive attuned, and a vizier if negative attuned. Rogues have some talents and guru can cover rogues, though none of the philosophies really fit the generic of generic rogues (a shadow one based on nihilism could be a good philosophy for future supplements). Really? Not to pick a fight or anything, but personally I think Arcane Schools and Domains are the most worthless, flavorless, and absolutely least interesting class features in the entire game, and I say this as someone whose game includes every Paizo book for Pathfinder and an equal number (possibly greater) of 3pp supplements. I mean, domains give a smattering of spells that in many cases may actually already be on your spell list, less than a handful of abilities (many of which scale poorly), and nothing after 8th level. I hardly ever see a domain get common use that isn't the Travel domain + whatever-other-domain-I-got-from-the-deity-who-gave-me-travel-was-least-ter rible. Arcane schools are possibly even more irrelevant, to the point that I have, on more than one occasion, literally seen players forget they even have them. With the exception of Divination, because moving first rocks when you have a book full of encounter-changers as your other class feature. Comparatively, the vizier's paths of mystic attunement give you abilities that can be key building blocks for entire builds, scale throughout the life of the character, and have big benefits that serve the whole group including transferring enchantments between weapons so that characters tied to particular weapon types can always use the cool new gear, simultaneously buffing the party while debuffing the enemy, or sharing veils and teamwork feats with the group to create a more mobile and effective party. Arcane schools and Domains are little splashes of goodies that in many cases will have minimal impact on a character build, while vizier paths will open up whole new party dynamics and options that can affect the way your character interacts with the group and how the group performs on some pretty profound levels. Just my opinion though. I kind of think of Daevic as the "fighter" option, though they're probably closer analogues to paladins and bloodragers. I did these conversions once upon a time, and I believe what I came up with is that the akashic subtype should be 3 RP and the bonus point of essence is worth 1 RP. That being said, I'm personally not a very big fan of the race point system, as I've found that you can have very powerful races with low RP, and kind of useless races with high RP. At best, I think of it as a secondary guidepost that should never be put ahead of experience and practiced judgement. Hope that helps! Oh, Ssalarn, any chance of some feats that make veils a little easier to hide without investing in Disguise? I was thinking without essence, though a feat to keep a passive veil invested with essence hidden more easily or one that allows an activated one to be invisible until used would be neat. Or perhaps another veil whose purpose is to conceal other veils? Absolutely. I'll probably go the feat route, something akin to the Tainted Essence / Veiled in Purity feats, because unless it was a secondary benefit of a cool illusion based veil with a worthwhile primary ability in its own right, I wouldn't want to charge you a veil just to hide your other veils. I think Sineaters do the rogue bit fairly well, thematically and mechanically, though they're a little more "bounty hunter" rogue than "sneaky pick-pocket" rogue. Yeah, I was meaning sneaky thief/pick-pocket when I said generic of generic rogues. Akasin are definitely the closest thing to a cleric in this release, though the Vedist I'll be releasing for playtest soon is a full blown healer/buffer who can invest essence into allies to buff them, and draw negative conditions out of them when he reclaims the essence. When brainstorming it called it Apophis I think, making it a primordial chaos/darkness/entropy thing, with incorporeality/turning into shadows/removing yourself from memory/etc., with slithering serpentine aesthetic tying into the egyptian god Apep. There definition the "fighter" option, but they definitely have a very non-generic flavour. So the Akashic Warrior and Veiled Lord are probably more generic fighter since they don't have daeva bundled in. My Nameer Guru was a pretty great rogue. I took a feat to invest two veils in the hand slots, chose Force Strike Gauntlets and Lashing Spinnerets (Gloves of the Master Thief if I expected any sort of traps) then invested into stealth and disable device every level with my skill points. I only had two less skill points, my combat prowess was comparable to an Unchained Rogue, I was just as stealthy and lock picky as a Rogue (well with essence investment I was better), and out of combat I'd say that having access to veils was handy in different ways than an Unchained Rogue's talents. If someone wanted to play a Rogue out of Guru I don't think they'd have any sort of problem whatsoever in terms of sneaky lockpickiness. Also we spent a lot of time in the jungle, so investing into racial stealth and Stalker's tabi made me a more terrifying ambush predator than Shere Khan. Yeah, I wasn't sure how hard you wanted to make it, but there's lots of mind-affecting veils that I think would be fun to make use of more covertly...as well as things that boost your social skills. Though a veil that could not only hide other veils, but potentially use magic aura or greater magic aura to hide or disguise the magical auras of your gear and perhaps any on yourself could be neat, perhaps with high level bind that acts as mind blank or a ring of mind shielding, possibly only with X amount of essence in it? Tangentially, a veil that gives access to disguise self while bound would also be cool, perhaps also granting a scaling bonus to Disguise, or making it so that the bonus to Disguise that would normally be granted by disguise self is dependent on essence invested instead the normal flat +10 bonus granted by the spell, and upgrading to veil with a higher level bind. Would be a lot of fun for tricky sorts of gurus and viziers. * Path of the Crafter gets one interesting ability....and then some bonus feats? Where are the abilities to destroy and repair items with a touch? * Path of the Ruler gives a single debuff/buff aura with little variation. How about some switachable aura choices or some more direct mind control? I guess the simplicity of the choosable features just doesn't interest me. The daevic is slightly better, but a similar issue. The guru, at least, has features that feel distinctive rather than series of minor bonuses + bonus feats. Damn you creatirs! Just when yhe biok finally came out you are tantalizing us with new content. Vedist sounds sooooo cool! If there is a new booj I would expect at least one more option for the three base classes, non-furry races, and tons of new veils. @Ssalarn... why I'm not your boss to put youbto work right now? Nice list! Vishkanya Snake Charmer sounds like a blast! I want to multiclass Daevic and Guru with a Solhofaat. Beat people up with a crimson totem and have a decent amount of self healing. Sobek Rageshaper too. There is just something awesome about being a big rampaging croc. Kobold rogue/slayer using those akashic talents. I love playing as a spider-man rogue. Constant detect magic for the purposes of identifying magic items. 1/2 his level to Craft checks. The ability to bypass spell prerequisites on spell trigger and spell completion items, which no one else can do. The ability to boost the CL or DC of spells cast with items for all allies within 30 feet. The ability to transfer magical properties between weapons. Got a badass +3 flaming holy halberd but your Fighter sunk all his feats into his longsword? Crafter's got you covered, and now the Fighter has a +3 flaming holy longsword instead. Craft Wondrous Item, Forge Ring, and Craft Staff, which, when combined with the vizier's other abilities, takes a strong and flexible class and makes it even more flexible and powerful, while making it an even greater contributor to the group, able to fill any holes or needs they might have. A 25% reduction in crafting costs, which also makes crafting faster, making the Crafter even better at what he does. An extra cantrip, and a small bonus to the cantrip's healing. A virtually worthless touch attack. Seriously. Why are you trying to ping an opponent's gear for a maximum of 16 points of damage at 20th level when you have the entire cleric spell list at your disposal? The ability to give a weapon the dancing special weapon quality for 4 rounds, a maximum of 4/day at 20th level, as a standard action. Crafter gives far more thematic functionality and contributes far more via his Mystic Attunement than the Artifice Domain grants. An unlimited use scaling debuff aura to Will and Sense Motive checks. An unlimited use bonus to allied Will saves. An unlimited use ability to force enemies to reroll their Will saves or Sense Motive checks. And it's important to note that the vizier isn't trying to stretch out his spells with his class features; veils are, by and large, unlimited use abilities. So when you combine this aura with veils like Hands of the Bard, Pestilence Cloak, Stare of the Ghaele, Bangles of the Jealous Seductress, Tentacles of Abolethic Sovereignty, Deathchannel Ring, Mantle of Murderous Intent, Crown of Inevitable Command, Cerebral Catastrophe Cinch, Waistband of the Wealthy, Cuirass of Confidence, and/or Vestments of the Maharaja, you have an all-day brain melter whose allies are less likely to be hijacked by enemy mind controllers. A scaling bonus to 3 skills, and a 20th level capstone that simulates a spell the wizard got at 13th level, except only against enchantment spells, and only affecting the wizard. A 3+Int touch attack to daze opponents that will only ever be useful against mooks, and probably not even most mooks after 5th level. A limited use, non-scaling debuff aura that's half the size of the Ruler's by the time it comes online. The vizier's abilities compliment his class, benefit the party, and scale to remain useful through his career. The Arcane school abilities are primarily selfish (focused on the individual instead of benefiting the group), limited, and in some cases exist for no other reason than to make you feel like you got something, even if it's something you'll never actually use. A 60 foot, scaling aura that increases the party's movement speed. 4 teamwork feats that he can use his level in place of his BAB to qualify for, and the ability to invest essence to share these feats with allies. The ability to grant a Hands or Feet veil to every ally affected by his aura. This is a ridiculously awesome buff, btw. Want to make the whole party even faster by giving them a veil that increases their movement and stacks with the aura? Coward's Boots. Enemies using poison? Snakehandler's Gauntlets. McGuffin on a pedestal in the middle of a volcanic chamber and you don't want to fly over because you'll alert the sentries? Lavawalker's Boots. The list goes on, extensively. The ability to retrain any and/or all of the granted teamwork feats each day. Got a stealthy mission? Grab Bonded Mind to give the group limited telepathy so you don't have to talk. Expect to deal with hard-hitting enemies like dragons or giants? Go ahead and snag Take the Hit as well so you can spread that damage out more manageably. Traveling to your next destination by airship? Go ahead and grab Target of Opportunity so you can blast your flying enemies into oblivion with coordinated volleys of ranged attacks. The only thing that limits Foresee Conflict is the amount of time you want to put into assembling combinations of teamwork feats for different environments and adventures. This guy used the teamwork feats to simulate speed manipulation tricks for a speedy hero! I definitely understand that you have that opinion, but I just don't see it. I've already compared vizier mystic attunements to arcane schools and domains, and they're pretty consistently more robust and better integrated to the character, things that are really a part of your character and the way you'll play the game. Daevics have equally, perhaps even more, robust class features that open up a huge number of options. Did you think the vritra were pretty cool akashic critters and want to play with one? A Desire daevic can have one as a companion. Want to play a magical lord or king who can protect and coordinate his allies or terrorize his enemies? Dominion does that in spades. Wrath is probably the only set of class features that are really simple, and that's entirely intentional, to give people a nice easy access point and to allow players who prefer the more classic "I hit it until it's dead" style of play to still get in on having a cool magical warrior that they don't need to spend too much time thinking about. And all of these class features are built around classes with a repertoire of unlimited use magical abilities that supplement, enhance, or otherwise compliment them. I'll keep your feedback in mind going forward though, and perhaps in a future supplement we'll release something that catches your imagination a bit better. I actually worked on an Occultist archetype at one point, but since Occultist kind of already is Paizo's stab at an Incarnum update, trying to unify the pools became a real headache. I may revisit it at some point though, I've already got some Emotion based guru Philosophies and daevic Passions sketched out, so that would be good to include. Mesmerist would be much easier to do akashic archetypes for. Ah, I missed some of those, so thanks. So I'm not sure what it is. It really might be the art throwing me off. I'll keep your feedback in mind going forward though, and perhaps in a future supplement we'll release something that catches your imagination a bit better. So, the first supplement I've got sketched out is Akashic Arts: Veridean Dreams. Veridean Dreams is tons of divination and illusion veils, akashic vanara variants, an akashic pixie PC race, some emotion themed mystic attunements, passions, philosophies, and the Vedist class. It already sounds like youve got something that might work. Not that it needs to do all that, just some random thoughts about how to replicate it...also a veil that creates a cloud for you to fly on with an appropriate bind would also be really cool...though I guess you could refluff Pestilence Cloak like that. Keep up the good work, looking forward to Veridean Dreams...and much, much more! I like the ideas! I think more weapon-like veils are definitely doable in future supplements. Also, with three 5 star reviews and a debut spot in the #4 slot on the Top 10 Bestsellers from Other Companies section of the Paizo newsletter, it feels like the completed iteration of Akashic Mysteries is off to a great start! I just want to thank everyone who has purchased or supported this product.